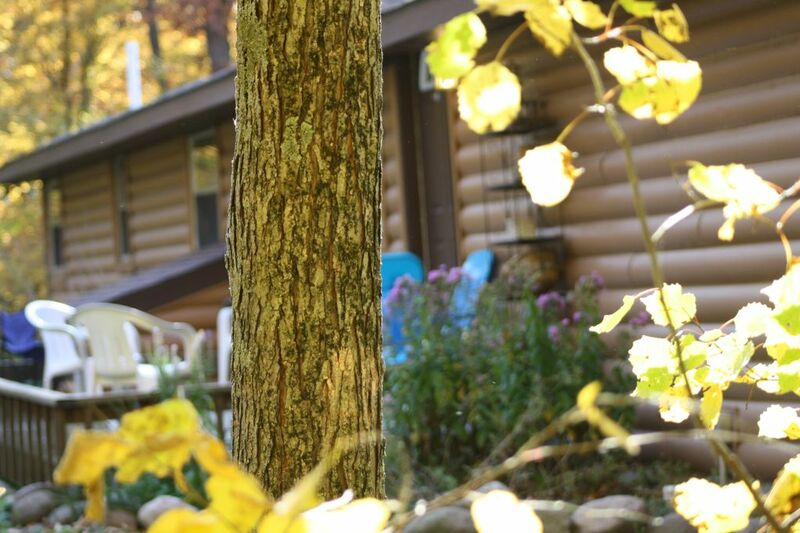 * Our cozy cabin is right in the heart of Minnesota's Vacation Land. Mille Lacs Lake is just 1/2 mile away. Tucked in the woods, abounding with wildlife and beautiful seasonal foliage, our cabin offers privacy but also access to many amenities around the Lakes. This scenic area caters to fishermen, ATV ers, golfers, specialty shoppers, archaeologists, hunters, snowmobilers, wind surfers, jet skiers and tired travelers looking to just relax, and read a book. Our shelves are filled with the classics.Now with internet you can keep connections with your business, family or friends by email. Our satellite internet is not good for streaming but is good for surfing the net. Our road connects to the Pine Center ATV trail. Our 3 bedroom Cabin sleeps 7 comfortably with 2 hideabeds for extra guests. Lovely new construction on the lower level features a King size bed with mirror, dimmer lights and cedar ceiling. 2 comfortable hide-a-beds sleeps 4 with an extra cove for a single bed. You'll like the bathroom with new fixtures and pine cabinetry. Handy Kitchenette with microwave and refrigerator in dining area. The pine stairwell takes you to two more bedrooms, one with a queen and the other with a double bed, living area, full bath & laundry. A spacious kitchen overlooks the woods. Creative decorating reminds you of home. Our air conditioned cabin is fully furnished with towels and bedding, dishes and pots and pans, even a food processor and deep fat fryer. In addition there is one large charcoal grill, 2 small charcoal grills, blender, toaster, coffee maker, coffee, tea and hot cocoa. Accommodations include 3 comfortable sofas, easy chairs and 2 TVs with VCR and DVD Player. Use our deck of cards and game board or bring your favorites. Sit on the deck outdoors or make a fire in the fire pit, wood included. There is plenty room to park your boat or rig or park your boat at Terrys boat harbor just 1/2 mi away. Fish for Walleye, crappies, sunnies, bass, northern and muskie, tulliby and perch. Rent a jet ski or just bask in the sun on one of the many beaches. Go to the many specialty shops in Garrison, Crosby or Isle or visit the Mille Lacs Lake Indian Museum, or Paul Bunyan Amusement Park, or Grand Casino. Dine at the many restaurants around the area including Broadway Pizza, The Blue Goose, Twin Pines, The Y Club, The Anchor Cafe, The Farm Market Cafe, Burger King, McDonalds and many more. Pets: should be well behaved, kenneled indoors on lower floor tile or outdoors. Fee is $50 per pet. Garbage: Guests will be charged $10 per bag that is not properly recycled. Recycle bin is provided for your convenience. Thank you for recycling! SUMMERTIME Activities include car shows, wild flower and mushroom walks, farmers markets, State Park Programs which include fishing, canoeing and climbing the 100 foot fire tower, garage sales, summer gospel concerts, classes on basket weaving, demonstrations of ricing and maple syrup making at the historic trading post, pow wows, bird watching, fireworks on the many lakes, parades, live blue grass, jazz and country music, dancing, New Mille Lacs Indian Museum, shows at the Casino and theater, fishing launch, biking and hiking trails, canoeing or tubing down the river, . Our area is home to most major denominations and faith. Our community is warm and friendly. You'll see! Dinner theaters, Charles Lindberg museum, most popular Brainerd race way events, world famous Aitkin fish house parade, Crosby motorcycle run, Pirates cove mini golf, water slides, go cart tracks. Other uses for our cabin: Use our cabin as a prayer retreat or retreat for pastors or missionaries, accommodate relatives during weddings or graduation celebrations. Use our 'honeymoon suite' for your honeymoon or anniversary. Crafters, get away for the weekend. Too tired to clean? Host your shower or a birthday party at our cabin You are only limited by your imagination. Our cabin will be decorated for the Holidays. A perfect place to spend a few days with your family. Bernie and Naomi grew up in the suberbs of Mpls. and graduated from Minnetonka and Edina High School respectively. Naomi fell into Bernie's arms (literally) at the Past Time skating rink , were married in 1985 and moved North to Onamia, Mn in 1988. Bernie is a Contractor and Naomi a Massage Therapist. Their 4 boys, Gabriel, Michael, Jon and Gene enjoy music, hunting, fishing, building and crafting. Gabe has crafted over 400 cribbage boards made from diamond willow inlaid with his favorite agates and built the stone fireplace you see in our cabin. He works as a carpenter with his Dad. Mike is navigating city life in Mpls working with His Workmanship Landscape Service and is a joy to be around. He enjoys playing cards, games, and dancing. Gene finished his 2400 mile trek down the Mississippi River in a kayak, works in Real Estate now and is happily married to Julia, who graduated with her RN degree. He loves to play his guitar. Jon married the love of his life, Lauren, who gave us our first grandson, Blake and our new baby grand girl, Amelia. He works as an Engineer, and loves to hunt, Lauren is a dental hygienist, and excellent wife and mother. Bernie and I originally came up North to work with a camp called Timber Bay, a retreat center particularly for hurting youth but also for church and other various retreats. We live adjacent to Timber Bay and have made this our home. We originally built the vacation rental home for our retirement. It is only 5 miles from our home and we enjoy the creativity it takes to keep it up and running, for guests who come up North for their vacation. The new constructed part of it is about 7 years old. The benefits include living next to a very popular vacation spot but also having the privacy and peace and quiet of the north woods. Its a 1 minute drive to the beach and wonderful activities around the Lake. We are surrounded by a variety of eateries, ATV and hiking and biking trails and beautiful sunsets and a star lit sky that will take your breath away. Satellite whole house internet, 10G anytime, 10G bonus from 2am-8am. Good for surfing the net and email, not good for streaming movies. No streaming. Access to internet and email. Satellite internet good for email and surfing the net. VHS player provided as well. We have bean bag toss and Norwegian golf, and board games. Lots of flowering plants. Surrounded by beautiful trees. Seasonal. Please ask about canoe availability and fees. Seasonal. Please ask about availability and fees. One picnic table and two benches that adjust to make a second picnic table. Newly renovated golf course just a few minutes away. Smoking outdoors only. Newly installed internet service. Cozy and clean place to go to get away for a weekend. The stay here was nice. The home was clean and the kitchen area had all the utensils we needed to eat and make food in the kitchen. Quiet and secluded. nice and warm in the home. Naomi was an awesome host who accommodated my arrival and check out time. And replied back fairly quickly. Definitely will come back again. We are looking forward to your family staying with us again. Hopefully next time the weather will be a little more accommodating. We would be happy to have Eric stay at our cabin again. He and his friends were respectful guests. Had a fun weekend going to the casino and lake. Great location. Very Homey. Walked in and felt right at home. Upstairs was nice and kitchen had almost everything we needed. Downstairs was very cool and comfortable. Family had a great time sitting around the table in the kitchen and talking about just everything. Only flaw that I found is one of the front speakers is out. Easy fix. If we come up that direction again, I will definitely try to get this place again! Plenty of room for a guys weekend getaway, fishing,golf and the casino are close, basement was nice for card games and the kitchen is large. There are lots of events on the lake within 3 miles of our cabin. Fishing for Ducks tounament, Kite Crossing on Mille Lacs, snowmobile races, golfing and baseball on the ice, small airplane events, craft events, festivals, concerts at the casino, movie theatre, Excellent Mille Lacs Museum and trading post, hiking, state park programs. Giant Walleye statue in the Walleye capital of the world is located 3 miles away. Battle of Kathio monument marker is located 3 miles away. These rates are based on 7 guests but the maximum occupancy is 11. These will be charged an additional guest fee of $25 per person per night.